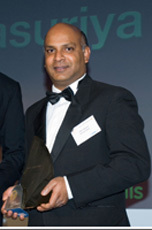 Ravin ‘Raz’ Jayasuriya (founder/director of OVM) recently won a UK National Training Award. At a Gala Ceremony in London, he was presented with the highest level of award in the UK by athlete Colin Jackson. The award was based on his application being judged as showing exceptional achievement through training and development. The award is managed by UK Skills which is an independent organisation that champions skills and learning for work through competitions, awards and events. The NTA is the UK’s premier accolade for training and development and recognises Ravin’s own personal learning journey in percussion and the impact this has had on his own life and on individuals and organisations through the tuition he offers. The award recognises his lifelong commitment to drumming and percussion, highlighted by the setting up of One Voice Music, an organisation dedicated to providing high quality training and education in Cuban and Brazilian percussion. It is a confirmation of the positive contribution his workshops and courses have had on the lives of individual participants and community music groups throughout the UK.